Blog providing articles and introductory guides to Socionics, the theory of personality type. Lucius Cornelius Sulla Felix was an aristocratic politician and military commander in the last century of the Roman Republic. He is best known as the first Roman commander to march on Rome itself and as the first to assume the office of Dictator without a preset term limit - even if he resigned after less than two years. Although his political goal had been to strengthen the then shaky foundations of the Republic, when he died in 78 BC his career and example had established the precedents for the dictatorship of Gaius Julius Caesar (SEE) and therefore for the later regime of the emperors. His life and personality are known from the writings of ancient historians, in particular Plutarch, who wrote a biography of Sulla partly based on Sulla's own memoirs, which have not survived. Background: Sulla was born in 138 BC, a member of the patrician (i.e. of highest nobility) clan Cornelius - arguably the most powerful clan overall - but Sulla himself started out in a relatively impoverished status despite his aristocratic background: although not destitute, he lacked the funds to pursue a public career. Frustrated, he turned to debauchery with Rome's underclass of actors, musicians, dancers, and the like. During this time he started a close friendship and homosexual relationship with the actor Metrobius, which continued on-off until Sulla's death at 60, even after Sulla's personal circumstances had improved drastically. At thirty. he inherited considerable wealth from a mistress and from his stepmother, which raised him to senatorial status, and then he apparently got connected by marriage to the rising plebeian "self-made" politician and military man, Gaius Marius (SLE). Marius, some twenty years older and now elected consul (most senior executive magistrate), took Sulla under his wing. In a campaign in north Africa, the previously inexperienced Sulla managed to capture the enemy king single-handedly through a combination of political intrigue and personal bravery. The next 8 years were marked by Marius' political supremacy, being elected as consul further five times while he commanded the armies fighting a Germanic invasion of Gaul and Italy. Sulla still served with Marius in this period, but once the military threat was over, Marius faded somewhat into the political background, and Sulla's career took off. In 97 BC he was elected praetor, and then served as governor of Cilicia (in southern Turkey), becoming the first Roman official to deal directly with the Parthian Empire (in modern Iraq and Iran) and to sign a treaty between the two powers. As per Sulla's own account in his memoirs, on that occasion he had an encounter that deeply impressed him: a Chaldean seer told Sulla that he was the greatest man in the world and that he would die at the peak of his success and fortune. Since then, if not earlier, Sulla held a firm belief that he was favoured by the goddess of luck, Fortuna, which seems to have given him total confidence in his personal destiny and success, allowing him to engage in remarkable feats of risk-taking. That is also the background for later taking the extra name of Felix ("Fortunate"). Back in Italy, Sulla and Marius were given major army commands during the so-called "Social War" between Rome and some of Italy's other nations. Among Sulla's achievements was receiving the highest military honour, the Grass Crown, by acclamation of the soldiers, for having personally saved his legion at Nola. This boost to his "CV" helped him get elected consul soon afterwards, and accordingly assuming the supreme command of the massive military expedition against King Mithridates VI of Pontus, who had invaded Rome's provinces in the eastern Mediterranean. However, that was derailed by the now elderly and bitter Marius, who in a sort-of "legal coup" used the Popular Assembly to transfer the military command from Sulla to Marius. Seeing that not only as a huge affront to his own personal and political standing but also (arguably rightly) as a strike against the very institutions of the Republic, Sulla took the unprecedented and even sacrilegious step of marching on Rome with six legions. Resistance was futile and Marius fled into exile. After a brief stay in Rome to consolidate his political support in the Senate, Sulla resumed his military expedition against Mithridates. The political arrangements he had set up in Rome quickly collapsed, though, to be replaced by the dominance of Marius and his followers, who returned to Rome in a bloodbath with the purge of Sulla's key supporters. Sulla was declared an outlaw and his immediate family forced to flee to join him in Greece. Marius himself died soon afterwards. Rome remained governed by Marius's partisans in an authoritarian but quasi-constitutional regime. Sulla's next five years were marked by a series of military victories in Greece, with him defeating Mithridates's forces despite numerical disadvantage. After reaching terms that restored Rome's territories and kept a humiliated Mithridates bottled up in his Pontus core territories, Sulla prepared to return to Italy to restore Rome's "true" government. The defenses set up by the "Marian" government proved no match for Sulla, who by now had also been joined by several younger exiled aristocrats, such as the future "triumvirs" Marcus Licinius Crassus (LIE) and Pompey the Great (EIE). So at the end of 82 BC Sulla re-entered Rome as the victor in the civil war. Militarily supreme, he legalised his political position by having the Senate and People appoint him as Dictator - a constitutional relic of the Republic whereby the usual checks and balances were suspended during a military emergency. However, while in the past the Dictators had been appointed to a fixed term of six months, Sulla insisted that he be appointed without a fixed term and specifically as "dictator for the making of laws and for the settling of the constitution". Thus, as Dictator, Sulla was also Rome's first "dictator" in the modern meaning of the term. Sulla's policies as Dictator consisted of: a violent series of proscriptions of his political enemies; constitutional reforms with the general aim of increasing the authority of the Senate at the cost of the Plebeian Assembly; and a series of more "nuts and bolts" reforms to improve the workings of the provincial governments and the judicial system. His reforms also aimed at making it far more difficult for any future commander to use his military forces against the state, as Sulla himself had just done. 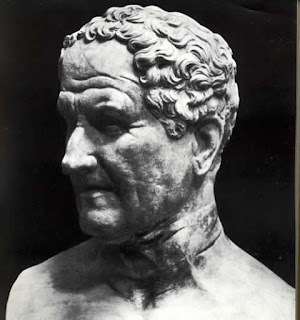 Sulla's policies have been sometimes called "reactionary" in the sense that they decreased the power of the popular assemblies and, in particular, of the office of people's tribune while increasing that of the aristocratic senatorial class. On the other hand, Marius's use of the Popular Assembly, led by his tame people's tribune, to remove a military command from Sulla - a sitting consul - had amounted to a subversion of the Republic's institutions and, if unopposed, in effect to a shift towards Athenian Democracy. Sulla would probably see himself as a "conservative" rather than as a "reactionary", someone reforming Republican institutions so they could work as they (supposedly) had for four centuries, defending it from those who would change it into something very different. Included in his proscription lists was the young Gaius Julius Caesar (SEE), closely connected to Gaius Marius personally and politically, but Sulla relented and pardoned him after pressure from Caesar's relatives, with Sulla quoted as complaining, "but in that young man I see many Mariuses". Sulla resigned the Dictatorship after two years, remaining however another year in government as consul, until retiring from politics for good at the end of 80 BC. He moved to a seaside villa accompanied by his new young wife, Valeria, and his on-off long-term partner the actor Metrobius. There he devoted himself to writing his memoirs and drinking parties with actor friends, as during his impoverished youth, and to sensual self-indulgence generally, dying just over one year later at 60. It has been suggested that by then he had been diabetic for some years. He composed his own epitaph for his tomb, one simple version of which would be: "no better friend - no worse enemy". Socionics analysis: Sulla's character and personality showed the following traits, throughout his life and career: personal daring and bravery, both politically and militarily, with high risk-taking; an unassailable faith in his own destiny and in his status as Fortune's favourite - his capacity for daring and risk-taking stemmed from his faith in his destiny and luck - he just "knew" he would not fail. Sulla was also very adept at all levels of personal relationships, confident in his ability to know whom he could trust and how much, who among this followers were reliable and true friends and who were merely opportunistic, and which enemies were reconcilable and which were not. R: The importance of R in Sulla's self-image is already clear from his choice of epitaph: "no better friend - no worse enemy". This is a man who prides himself in his unerring ability to know who his friends and his enemies are, and in his resolve in paying them back as they deserve. It is a self-portrait of a man for whom R is at the centre of his thoughts and motivations, and it is the harsh, unforgiving Gamma version of R, blocked with F, rather than the more open Delta version. Throughout his life and career, Sulla always felt he thoroughly understood the nuances of all his personal relationships. His initial "big break" in his career - the capture of King Jugurtha of Numidia - was the result of risky backroom politics where any misplaced trust would have resulted in his death. Later, at the peak of his power, he confidently evaluated the attitudes towards him of his associates and treated them accordingly: whether as opportunistic careerists attached to him out of self-interest (like Pompey, Crassus and Catiline), or as truly devoted followers (like Lucullus and Metellus Pius), or as in selfless romantic attachment to him (Metrobius). More specifically, although he seemed to show more obvious public favour to Pompey, with Lucullus more in the background, Sulla's total trust in Lucullus was clear as he made Lucullus the executor of his will and gave him more critical commands in the war against Mithridates. Sulla flattered Pompey and threw him occasional bones such as marriages into the aristocracy (yet not really at the very top of the aristocracy), but only gave Pompey commands where he would be no real threat to Sulla. He knew exactly how he needed to treat each of them (and how each deserved to be treated). The same went for whether someone was a bitter irreconcilable enemy (like Marius or Sertorius) or, even if hostile, not a real threat (like Caesar). Sulla never fell victim to misplaced trust because he very seldom made mistakes in that area, and was clearly proud of that. That points to someone for whom R was a very strong as well as valued function, pointing to an Ego function, i.e. R1 or R2. F: Sulla's ease with the use of power and force - whether as personal authority, or as physical bravery on the battlefield, or in military tactics, or as ruthless political violence (on occasion ordering men to be executed on the spot) - is obvious, although arguably that would be just a "job requirement". It is difficult to see, though, how a man not very focused on F would excel in all its aspects to the level that Sulla did. But more clearly, Sulla himself wrote in his memoirs that his best decisions were always the impulsive ones, when he just did what he felt he had to do, without thinking much about them. That is the mindset of a person with much stronger F than I, that is, inclined to be in a "battle mode". F is likely not only a valued function but a strong one in Sulla. That suggests F1, F2 or perhaps F8. This is further reinforced by the reports that he found it easy to intimidate others when in their direct presence - this is not a quality normally associated with individuals of weaker F.
T: Sulla's confidence in his instinctive, impulsive decisions was backed by a total faith in his destiny to success. He himself recorded for posterity the impact on him of the prediction of a Chaldean seer, that Sulla not only was the greatest living man in the world, but also that he would die at the peak of his power and success. That belief essentially removed from Sulla any visible self-doubt or fear of failure - as if his only "path" in life was that of success. That is also evidenced by Sulla's belief that he was a favourite of Fortuna, the goddess of luck. That was reflected on his adopting the surname Felix (the Fortunate), and building the massive temple to her in Praeneste. Interestingly, as Plutarch observed, unlike most people, Sulla preferred to attribute his victories and success not to his own ability, but to his luck - that is, his destiny and protection by Fortune. His source of confidence, even self-esteem, was not "I am so competent" but rather, it seems, "it will work out in the end". This shows a focus on a T "vision" as a source of reassurance and confidence, but a focus on T that seems very single-minded. That would point to a valued but not particularly strong function, suggesting T6 or T5. yet suggestive T does not seem likely as he did not seem to rely on others, except for occasional "help"(as from the seer) which served, it seems, essentially to confirm his own T. T6 fits Sulla's approach to T perfectly and in itself already points to ESI or LSI as Sulla's type. S: Whenever Sulla was not ruthlessly focused on the job at hand or plotting his advancement, he drifted to the enjoyment of sensual pleasure. Parties, drinking, eating, a comfortable life, pleasant surroundings. In the two periods in his life when he was not concerning himself with his career - his enforced inactivity in his youth, and then after his retirement, he devoted himself to sensual self-indulgence, even debauchery. In fact, during his active career, even in military campaigns, he would easily get into an "after hours"mood of fun and relaxation of a sensory nature. This points to S as something he would drift to when not actively focusing on work, and seems most like a background function, or S8, also connected with strong R and E, since his S amusements were of the social sort, rather than the more impersonal sort more associated with L or P (such as manual work). E: Sulla had no difficulty in the area of interpersonal relationships as a politician, as already mentioned above in the R section. Yet, he was not noted as a "charismatic" politician, or even as a military commander, who could move crowds or even the Senate by the strength of this oratory or personality. He had some pride in his abilities in showmanship when organising games and spectacles for the populace, but that was clearly not his main focus. E seemed to be something in which he was confident but did not consider important - suggesting E7. "In his punishments and his reactions to injury, the same inconsistency is to be observed. He would have a man beaten to death for some inconsiderable offence, yet on other occasions he would meekly put up with really serious misdeeds. He would cheerfully become reconciled to people who had done him quite unforgivable injuries, and in other cases because of some trifling misdemeanour the punishment would be death or confiscation of goods." This suggests that he was not really that focused on being logically and impersonally consistent in those areas, and that his judgement was more influenced by his own attitude to the individuals involved - that is, a higher focus on R than on L. Yet, Sulla was concerned with putting together a - more or less - consistent legal framework for his reforms, which shows an awareness of L+F. Even so, the inconsistencies and contradictions of that framework also led to a large part of them being dismantled ten years after Sulla's retirement. One such glaring contradiction was his "special commands" clause that benefited mostly Pompey and that went against the overall principles of his new constitution. Sulla's approach to L suggests awareness and being concerned with it but ultimately overruling it with R. That points to L as a Role function, L3. P: The P that is obvious in Sulla's priorities is in his "nuts and bolts" reforms of the constitution - which actually were the most enduring of his reforms, outlasting the Republic itself: a thorough revamping of the justice system, establishing permanent and specialised courts, and a reform of the senatorial "career plan". Those were practical, pragmatic reforms that were not connected to specific ideological or political agendas, so P rather than F, L or E. Also, the men whom Sulla liked to have around him as sidekicks - men such as Lucullus, Metellus Pius, and even Crassus and Pompey - were men whom he could trust as to their loyalty, but also men judged by him to be reliable and competent at specific tasks. Nevertheless. as already mentioned in the T section above, Sulla claimed no credit for his P achievements, preferring to attribute them to his luck and specifically to his protectress Fortuna. This points to a man who does value P but is extremely reluctant to claim competence in it - so P as a valued but weak function, such as P5, would seem to fit very well. I: It is difficult to see in Sulla''s life and career traits, preferences or actions that could be attributed mainly to a focus on I. He did show the ability of "thinking outside the box", but those were usually connected to military and political tactical improvisations, i.e. mostly related to F. He saw himself as a man of quick decision-making rather than of careful reflection and creative innovation - even his constitutional reforms were largely based on "turning the clock back" rather than originality - as compared, for instance, to those of Augustus (LIE). I looks like a weak and subdued function, I4 fitting best. Conclusion: What we have is a man with high focus on R and F, which look like his Ego functions, also with a single-minded, "tunnel-vision" faith in his destiny that seems most like T6; a man with more apparent confidence in L than P but who seemed to value the latter over the former; and a man who consistently preferred S+E activities as sources of relaxation. The type that fits Sulla's functional strengths and preferences is ESI. A more superficial, excessively broad-brush view of his career might point to LSI, which I argue would be his only other plausible type; but a more detailed analysis makes ESI clear. Sources: The modern, scholarly biography is Sulla: the last republican by Arthur Keaveney. Keaveney's own analysis of what made Sulla tick, in his last chapter, already makes ESI clear. The most important ancient source is Sulla's biography in Plutarch's Parallel Lives; Plutarch had access to Sulla's own memoirs, now lost. 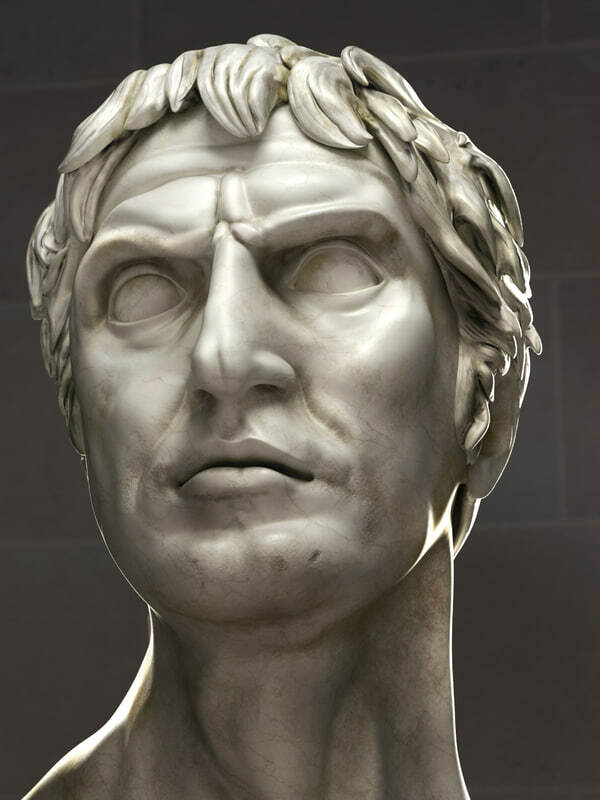 The Jugurthine War by Sallust is important for Sulla's "big break" in his early career. The Master of Rome series of historical novels by Colleen McCullough, a medical doctor, has well-argued speculations on the nature of Sulla's ailments. To learn more about the ESI, click here. If you are confused by our use of Socionics shorthand, click here. This article aims to address the most common difficulties that people have while trying to type themselves, and strategies they can use to overcome them. Compare your knowledge between the two. Failure to properly identify the TIM is usually related to inadquate knowledge of Socionics or to making the process more complicated than it needs to be. It is imperative that you are able to understand and describe yourself on your own before you attempt to do so with a typology. You can develop self-knowledge and Socionics knowledge concurrently but you must be wary of trying to interpret your thoughts and behaviour according to Socionics when you don't have a decent understanding of at least one of those things. If you're really struggling, the problem might be that you're only seeing what you're looking for (i.e. evidence to squash you into a particular type) and in the process missing some important information. In this case it is best to totally separate the processes of developing self-knowledge and Socionics knowledge. If you're not sure where to start or what would be relevant, you can just start with things you find fun to think about. Generally speaking the more you know the easier it should be, but it's also easy to get caught up in trying to figure out which obscure, poorly-described dichotomy you belong to and such thinking is counter-productive. If you need to resort to more complex theory to justify your self-typing then it's not a strong typing. All you need to justify your typing are the functions, IM elements, intertype relations, and quadras. If you're struggling, bring your focus back to those key things. It's also important to emphasise that we are talking about Socionics knowledge. Not Enneagram, not MBTI, not any other typology under the sun. In fact, it's best that you forget you had even heard of those typologies, let alone your types in them, while you figure out your Socionics type. Seriously, don't even think about them. If you try to figure out your Socionics type in the context of other typologies, you will take much longer to find your type and it will be weaker and less confident. It is better to figure out your type through study and reflection, partly because this is how you learn about Socionics anyway and partly because there are many problems with personality tests. Many of them are poorly-designed to begin with, and even when they're not there can be issues with response bias or poor insight. Perhaps they can be used to get a sense of direction but you should certainly not stop with them. If you're finding the learning curve to be steep it may be worth your while to ask someone experienced to type you. This can be very valuable, but it is important that you aim to understand their analysis or you still won't feel confident about your type. There are two main ways about this: identify aspects of yourself that are unusual compared to the general population, or identify parts of your life experience that elicit a strong emotional response. This is a particularly good way of identifying the leading, vulnerable, and mobilising functions. This is a good strategy for type-hoppers and for people whose understanding of Socionics outstrips their self-understanding. Instead of trying to put all the pieces together at once, narrow your focus and aim for 1 IME at a time. Don't move on until you're really sure! It is ideal to identify the exact function, for example "leading S" or "vulnerable E", but it is sufficient to just get as far as "4D S"/"1D E", or "strong, valued S"/"weak, subdued E" (so long as you're really sure about it!) and figure out the rest with other information. It is easiest to do this with the 4D functions (leading, demonstrative) and 1D functions (vulnerable, suggestive) because they tend to stick out the most (see the previous section). If you're confused or uncertain you can go by your emotional response. 4D functions elicit feelings of competence and ease, they will frequently be associated with positive experiences. 1D functions elicit feelings of frustration, resentment, and boredom (among other things). Kindred: Identify quadra values, vulnerable function, mobilising vs. demonstrative functions. Quasi-identical: Identify quadra values, vulnerable vs. suggestive functions. Extinguishment: You've probably come from MBTI. Forget MBTI. Mirror: Ideally you should never be in this situation, but if you are you want to focus on mobilising vs. suggestive functions. It's easy to get stuck deciding between mirrors indefinitely, so if you can't figure it out easily then start from scratch. It will save you a lot of time. Activators: Identify creative vs. suggestive functions. Type-hopping: You probably have impaired insight for some reason (see: Special cases). It is best to start from scratch and find one IME to be certain about before proceeding. In general you don't want to compare strong functions with strong functions. Whichever types you're comparing, pick an IME to compare that is strong for one and weak for the other. In some cases there are factors at play that impair insight or introduce ambiguity, and these deserve their own treatment. These can best be discovered by trying to explain Socionics to a third party. Typically people have the hardest time describing things that are related to their weakest function, including in trying to straightforwardly explain them. You must be careful not to confuse an incomplete understanding with a type-related gap, but if there is an IME you struggle to describe adequately for no good reason then it may be one of your weaker functions, especially your 1D (vulnerable or suggestive) functions. Another way this might show up is if your understanding is fine but you struggle to come up with examples on the spot compared with everything else. People with low I often struggle with giving summarised or general information and may give information that is too detailed or not detailed enough. They may also have more difficulty describing their own personality as a result. People with low S may resist giving more than general information. People are likely to over- or underestimate their proficiency with their weak functions and may not recognise that they're actually weak. Logical types may have more difficulty understanding their emotions. People with 1D-L may struggle to seeing patterns in their thoughts and behaviours, especially E1s. They may see themselves and extremely variable and "hard to type". Sensors are more likely to distrust their own insights, especially Socials. Rational ethical types (ESE, EIE, ESI, EII) may feel like they need some kind of external framework to make sense of themselves. People with low, valued I may be overly credulous about praise and criticism. It comes up from time to time that someone will feel uneasy about their self-typing due to some physical symptom that is at least partly due to illness or disability. This is usually things like people with severe fatigue wondering if they can still be extratims, clumsy people wondering if they can still be sensors, etc. In general these kinds of issues aren't very significant in the context of Socionics. You don't need to tick every box, just more on one side than the other. If we take clumsy Sensors for example; clumsiness might be seen as a sign of low S/F, but it's not definitive unless are are other signs of low S/F and also signs of high I/T. It's generally not worth your consideration, because you'll either find it's an anomaly that doesn't count or just one point in a long list. People with mental health issues have a harder time figuring out their type, especially if they have trauma. They are more likely to type-hop and have protracted states of uncertainty even after developing a good understanding of Socionics. Even outside the context of personality typologies, people with mental illnesses often report having trouble figuring out what is really them and what is their illness. Additionally, having low confidence will making it more difficult to see the difference between your weak and strong functions. If you're in this category and you're struggling to figure out your type, it's probably best to a method that is more targeted. It will be especially important to separate the processes of understanding yourself and Socionics. Stop, breathe, clear your head. Take a break if you're frustrated. Remember to keep it simple. If you're been struggling for a while, especially if you're stuck between different types, start over from scratch. Your old understanding obviously wasn't helping you. Look for information about yourself, your thoughts and behaviour in different situations, and take it at face value. Interpretation will come, don't force it; you'll find the pattern as you go. Be curious and patient rather than look for specific answers in desperation to answer a question. Cristiano Ronaldo dos Santos Aveiro is a Portuguese football player who currently plays for Juventus and the Portugal national team. Born on the Portuguese island of Madeira in 1985, he has since won over 26 collective trophies and 5 Ballon D’ Or awards, playing at Sporting CP, Manchester United, and most recently, Real Madrid. His immense success has garnered the respect of the footballing world, with many pundits considering him among the best of all time. One of the most defining characteristics of Ronaldo is his strong willpower. Being an athlete, it is convenient to say that he is competitive – as this is a shared trait among a plethora of sports players. However, what one must highlight about Ronaldo is that his determination and strong desire to win enables him to score whenever and wherever he wants to – this being the skill that makes him not only a great football player but a key figure in the world of sports. It is also interesting to point out that while Ronaldo does seem to have an almost relentless energy to him, he still recognizes the importance of getting sufficient rest and eating properly in order to achieve his goals, attempting to sleep for at least eight hours and eating balanced meals. However, when not resting, Ronaldo is in a mode of constantly “doing” things – trying to fit in some kind of physical activity whenever he can. Moreover, while Ronaldo believes rest is important, this does not prevent him from wishing to play all the matches (whether it be a friendly or a significant tournament i.e. World Cup), even if playing while injured! For these reasons, it is fair to say Ronaldo has a very strong and valued use of F ( most likely F1), while at the same time a somewhat strong, but unvalued S ( probably S7). Briefly mentioned in the last paragraph, Ronaldo has had a tendency to push his body in order to play in numerous matches, ignoring any pain or injury. Not only does this demonstrate an unvalued S, it also emphasizes very weak T, as these injuries prevent him from attaining long-term goals. For example, in 2016, his decision to play the Champions League Final (in which he scored the winning penalty) and the majority of Euro 2016 came to haunt him, as the injury he had been ignoring erupted, leaving him unable to play against France in the final, and consequently missing pre-season with Real Madrid. In 2017, his rash, impulsive decision to push a referee in a Super cup game versus Barcelona not only got him sent off for the return leg but also made him miss the first four league matches with Real Madrid – a fundamental absence that left Real out of the title race very quickly. From these events, it is very clear that Ronaldo does not clearly enough reflect on the consequences of his actions, and seems to keep making the same type of mistakes due to his impatient nature. For these reasons, it is blatant that Ronaldo struggles very heavily with T (most likely has T5). It is noteworthy to recognize that not only is Ronaldo popular in the world of sports, but outside of sports as well, having the most followers on Instagram and being considered one of the most charitable athletes. Therefore, it is fair to say that Ronaldo is a quite popular guy, being very charismatic in nature and easily being able to win over a group of people – indicating quite a strong use of E. However, the evidence seems to suggest that while he uses E strongly, it is not something he values all that much. In essence, Ronaldo does not seem to care about maintaining an emotional mood or atmosphere. In fact, he seems to have more of a professional and pragmatic attitude, caring more about the improvement of the team and working diligently with his teammates in order to win games and trophies. Again, Ronaldo feels as if there is always room for improvement, wanting to set new records and goals for himself (whether that be goals scored, trophies won, individual awards) and not using his increasing age as an excuse. Hence, it is reasonable to conclude that while Ronaldo isn’t bad at E, his priorities and values deal much more with P, possibly indicating a functional ordering of E8 and P6 and a preference of Gamma over Beta values. In 2018, Ronaldo’s post-match comments after the Champions League final also highly reflect both his low focus on maintaining a common or unified emotional atmosphere. While the team had won their third consecutive Champions League in Kiev, the Portuguese goalscorer hinted at possibly leaving the club. Ronaldo would then face criticism by team captain Sergio Ramos and manager Zidane (most likely both Beta types), as the focus shifted from the positive emotional atmosphere of winning the trophy to a pessimistic one, as the club would possibly lose its most valuable asset. 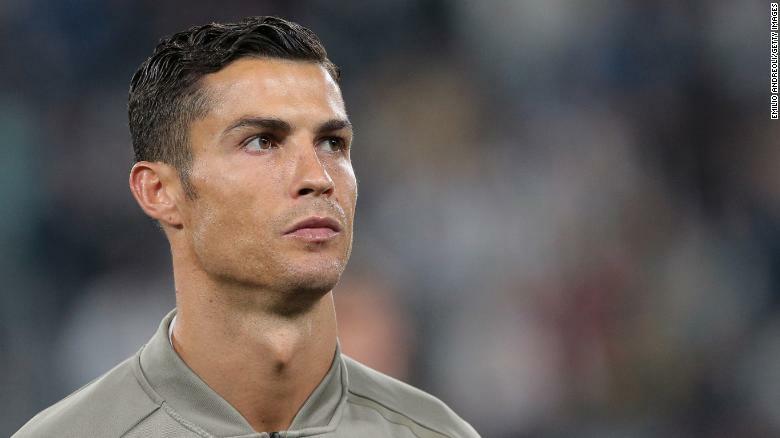 While Ronaldo did indeed apologize afterward, the comments are indicative of strong R (most likely R2), as he is not afraid to express his emotions sincerely, even if it might be controversial or harmful to the common emotional mood. When one looks to the reasons as to why Ronaldo made those comments, it becomes even clearer that he values personal loyalty over loyalty to a system or institution. One of the primary reasons that Ronaldo threatened to leave the club (and eventually did) was because he no longer trusted the club’s president, Florentino Perez. In the face of a tax evasion scandal he claimed not to be responsible for, the Portuguese hoped for a new contract with an increased wage to more easily pay off the authorities. Contrarily, Perez believed that it was irrational to increase the salary of a player who would almost be forty years old at the end of the supposed new contract, as the massive payments would put the club in jeopardy of signing the new generation of superstar players. This focus on personal loyalty again hints at Gamma values, as Ronaldo saw the president’s refusal as a betrayal, meaning he could no longer trust in him. In addition, Ronaldo’s belief that he should not be subject to a hierarchy or system and should be able to get whatever he demands can even be indicative of a very weak and unvalued L, most likely L4. Additionally, after the victory in Kiev, Ronaldo stated the tournament should be called the “CR7 Champions League”, even though the team with the most titles (his own team, Real Madrid) had won 13 (yet he had only won 5). Lastly, his desire to want to take all of the free kicks (while there were much better kickers than him) or play all of the matches (even if he was getting older and needed more rest, or was injured) emphasize not only the weak rationale and capriciousness behind his decisions, but also his reluctance of any rules or hierarchies that could possibly get in his way. F1, S7, T5, E8, P6, R2, and L4 all seem to correspond to the functional stack of the SEE, making it Cristiano Ronaldo’s most likely type. To learn more about SEE, click here. "Life truly begins only after you have put your house in order." Marie Kondo is a Japanese organising consultant and author, known primarily for the KonMari method of tidying and has become a viral sensation with her 2019 Netflix show, "Tidying Up With Marie Kondo." a bright and joyful future." Kondo is a friendly, cheerful woman who frequently demonstrates her emotions with expressive vocalisations and animated movements. On "Tidying Up with Marie Kondo", she is seen to greet clients enthusiastically, mirror clients' excitement, and empathise and cheer them during frustrating moments. She is excited to be able to help clients improve their homes and lead more joyful lives. 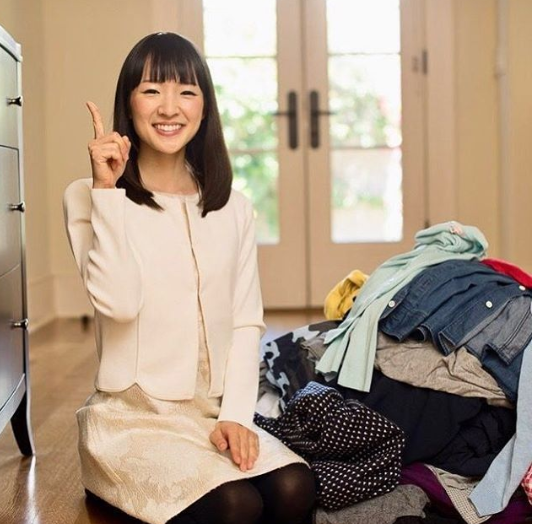 The hallmark of the KonMari method is the concept of tokimeku. Tokimeku is frequently translated into English as "spark joy", but the more literal translation is "[heart] throbbing/fluttering". In Japan, the word is usually used in the context of falling in love, and Kondo's use of it in regards to tidying and home organisation is a comprehensible but idiosyncratic decision that reflects the paramount importance she places on emotional experiences. "I chose this standard for a reason. After all, what is the point in tidying? If it's not so that our space and the things in it can bring us happiness, then I think there is no point at all. Therefore, the best criterion for choosing what to keep and what to discard is whether keeping it will make you happy, whether it will bring you joy." -- "The Life-Changing Magic of Tidying Up"
Tokimeku is a concept that falls within the realm of E, and its association with a personal, physiological experience, rather than a "meaningful" one, suggests a concurrent emphasis on S. This makes Alpha Socialite (ESE or SEI) a likely type for her. She also emphasises the importance of physically interacting with objects in order to develop a positive relationship with them in the first place, whether it's learning to like essential items that don't 'spark joy' or learning to appreciate personally-unappealing possessions of family members. [...] If you cannot avoid seeing certain things, then try facing them head-on. Start by touching them. If Y had only looked at her husband's things without touching them, she would never have been able to see them as anything other than toys. Once she held it in hand, however, the object became real. A figurine, for example, was no longer an anonymous samurai but the great leader Takeda Shingen. This alone can reduce aversion to such objects by half." -- "Spark Joy"
Her emphasis on physical interaction suggests strong, likely valued S with concurrent emphasis on E.
Due to her focus on tokimeku, her tidying and organisation recommendations can be out of sync with conventional wisdom. The actual tidying process is inefficient in terms of movement and energy. Every item in the house is handled multiple times, and some of the routines she recommends for maintaining a tidy house involve double-handling (for example, filling and emptying your purse on a daily basis). These are purposeful decisions that have their own advantages but nonetheless indicate valued E and weak, subdued P.
Another out-of-sync aspect of the KonMari method is the choice to tidy by category, and in a specific order, rather than by location. By all accounts, this is very effective, but although Kondo arrived at the order through her own experimentation, she says she doesn't know how all of it works. Despite the idiosyncrasy, she created a method she was able to communicate and apply in a wide range of situations for a wide range of people, and this suggests normative (i.e. 2D rather than 1D) P. At the same time, the lack of clear understanding suggests weak P. Overall, this fits P3 best. "Take, for example, my vacuum cleaner. I got rid of it because it was an outdated model, and instead diligently wiped the floor with paper towels and rags. But in the end it simply took too much time, and I had to buy a new vacuum. And then there was my screwdriver. After throwing it away, I tried using a ruler to tighten a loose screw, but it snapped down the middle. This almost reduced me to tears as it was one I really liked." -- "Spark Joy"
"All these incidents stemmed from youthful inexperience and thoughtlessness. They demonstrated that I had not yet honed my ability to discern what brings me joy. Deceived by their plainness, I failed to realize that I actually like them. I had assumed that if something brought me joy, I would feel a thrill of excitement that made my heart beat faster. Now I see things differently. Feelings of fascination, excitement, or attraction are not the only indications of joy. A simple design that puts you at ease, a high degree of functionality that makes life simpler, a sense of rightness, or the recognition that a possession is useful in our daily lives - these, too, indicate joy." -- "Spark Joy"
This is another example of weak, subdued P and strong, valued E.
joy and never even realise it." As she is focused on the very much in-the-moment experience of tokimeku, her attitude towards discarding items is very dismissive of reasons for keeping items that are based on something having been important in the past, nostalgia, relationships with other people, concern about needing something in the future, or otherwise any attachment that is not rooted in your immediate experience or lifestyle. Adding to this a personal tendency to take action and assume it will work out, we have a picture of weak, subdued, likely vulnerable T, subdued R, as well as strong, likely 4D F.
The KonMari Method itself is designed to guide and motivate the tidier through a series of emotionally impactful exercises. This is not limited to simply physically interacting with each object in search of tokimeki. Before tidying begins, tidiers are asked to think about their "ideal lifestyle" that they hope tidying will facilitate. "As you continue to explore the reasons behind your ideal lifestyle, you will come to a simple realisation. The whole point in both discarding and keeping things is to be happy. It may seem obvious, but it is important to experience this realisation for yourself and let it sink into your heart." -- "The Life-Changing Magic of Tidying Up"
Her books are replete with emotionally-charged anecdotes from herself and her clients, and shares these anecdotes to help clients in person as well. The process of tidying is also riddled with moments to shock the tidier into rethinking the possessions that they own, for example placing all items from a single category into one large pile. She also supports her clients to learn how to experience tokimeku, a demonstrates a nuanced understanding of how different people physically and mentally experience their emotions. Her superior understanding and ability to turn it into practical application suggests strong, likely valued, likely 4D E.
While personally placing a high value on tidiness, expresses strong opinions and enjoys giving advice, she is very clear that she opposes coercion in tidying. Tidiers are advised to ignore the mess of family members and focus only on their own space. Kondo relates that when she was younger she believed tidying would make everyone happy and tried to reform her family members, but found it resulted in negativity. When working with clients who have committed to the tidying process, however, she can be quite strict. In the first episode of "Tidying Up with Marie Kondo", one of the clients observes, "You look sweet, but on the inside you really mean business." A combination of proactive helpfulness (or "bossiness") with a wish to avoid negative emotions and an attitude of live-and-let-live in personal relationships suggests strong F and linear-assertive temperament within the Alpha Quadra. Kondo fully expects that changing the emotional atmosphere of you environment by tidying will also lead to positive changes in other aspects of your life. Some of this is basic on somewhat mystical ideas rooted in Shintoism but much of it is the idea that your emotional state sets the tone for everything else in your life; both in the sense that happiness begets happiness and that orderliness that "sparks joy" is actually a necessary condition for moving on in your life. Kondo particularly focuses on the positive changes that tidying and the resulting environment that "sparks joy" can bring to family relationships. The consistent emphasis on your own emotional state being the driver suggests that E is valued and R is subdued. “The true purpose of tidying is, I believe, to live in the most natural state possible. Marie Kondo's pervasive and multi-faceted emphasis on emotional impact and emotional states indicates strong and valued E, and her readiness to communicate her own internal states (and the frequency with which she does so) indicates E1. Her emphasis on the physiological experience of emotions as well as their particular relationship with one's lifestyle also suggests strong, valued S2. Kondo's implicit assumption that positive emotions will lead to positive relationships indicates R in the Id block, especially R7. Her practicality indicates a tendency to stronger S and a tendency to use P, while her more vague understanding of her method and tendency to abandon practical measures for emotional ones suggests weak P3. Kondo's proactive and decisive nature, along with her assumption that things will work out fine after acting, indicates a linear-assertive temperament, 1D T and 4D F, making them good candidates for T4 and F8. Her strong preference for, and commitment to, experiencing positive emotions, along with her appreciation for structure and live-and-let-live attitude, indicates that she belongs to the Alpha Quadra. Altogether, this suggests that the most likely type for Marie Kondo is ESE. To find out more about ESE, click here. "The Life-Changing Magic of Tidying Up"
Carl Sagan was an American astronomer, cosmologist, astrophysicist, astrobiologist, creator, science popularizer, and science communicator in space science and other normal sciences. He is best known for his commitments to the exploratory examination of extraterrestrial life, including test showing of the creation of amino acids from essential chemicals by radiation. Sagan gathered the main physical messages sent into space: the Pioneer plaque and the Voyager Golden Record, all inclusive messages that could conceivably be comprehended by any extraterrestrial knowledge that may discover them. Furthermore, he distributed more than 600 scientific papers and articles and was writer, co-writer or editorial manager of more than 20 books. Sagan composed numerous prevalent science books, for example, The Dragons of Eden, Broca's Brain and Pale Blue Dot, and described and co-composed the honor winning 1980 TV arrangement Cosmos: A Personal Voyage. What is most unique about Carl Sagan's research papers, is his recursive passion for seeking out new astronomical information and experiences that stimulates the mind of the reader, thus opening up the reader to new possibilities for thought. Typically, his books address a very broad range of concepts in astronomy, extending beyond what is usually expected to be mentioned in books about astronomy to going in expansive depth on general scientific knowledge to abstract theories. In addition, his books frequently mention theories that were poorly understood at the time or simply unknown phenomenon without essential explanation. It is clear that Carl Sagan was heavily drawn to the abstract side of how the world works and his approach to scientific research was philosophically bent, with a quality of connecting various scientific concepts that were discussed by individuals at the time into a grand simplification of science - so that his conclusions could make logical sense to those reading his published works at the time. This gives the notion of someone with a preference of logical optimism over critical skepticism in dealing with abstract theories, providing the case for a type with Ego I+L, most likely I1 and L2 considering his very broad range of concepts covered in his works support the idea of Strong and Bold I.
Carl Sagan pertained to a style in his writing of systematizing his insights about the universe and contributing essential details towards emerging theories at the time. These details applied across a vast number of works produced by historical scientists, utilizing this information and applying it into a grand framework of the universe that Stephen Hawking had been longing to cultivate. In open ended discussion and interviews, Carl Sagan wanted to include those from heavy academic backgrounds who enjoyed an intellectual challenge to people who didn't know very much about science - but still was as passionate about it as Carl was. 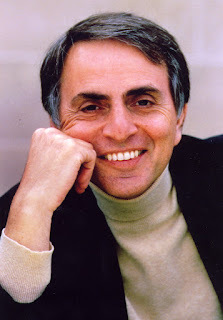 Another interesting notion was that Carl Sagan included those he disagreed with in these discussions, showing a greater interest in generating an Alpha group atmosphere with L-focused frameworks on how the universe works to E-focused digressions responding on the emotional significance of humanity's place in the cosmic arena. Overall, Carl Sagan couldn't help but share his insights on the interesting scientific discoveries of the time and always had some interesting topic on his mind. Carl Sagan would often skeptically interrogate and propose thought provoking questions towards religious fanatics during more serious interviews and he often had a propensity to point out the flaws in a doctrine or set of laws that he perceived to be false. In one article, he wrote; “If you’re only skeptical, then no new ideas make it through to you. You never learn anything. You become a crotchety misanthrope convinced that nonsense is ruling the world. (There is, of course, much data to support you.) Since major discoveries at the borderlines of science are rare, experiences will tend to confirm your grumpiness. But every now and then a new idea turns out to be on the mark, valid and wonderful. If you’re too resolutely and uncompromisingly skeptical, you’re going to miss (or resent) the transforming discoveries in science, and either way, you will be obstructing understanding and progress. Mere skepticism is not enough.” This approach to skepticism through maintaining an expansive and eclectic mindset is often present in types with T7, limiting himself to only select resources to base his work off of repulsed him and instead he chose to spread his endeavors over an expansive scope of territories. Carl Sagan continued doing what he did from the start, promoting science and "eagerly passing on the marvels of the universe to a huge number of individuals on TV and in books." Whenever Sagan showed up on ''The Tonight Show" with Johnny Carson amid the 70s and 80s, his objective was to interface with regular Americans, individuals who didn't subscribe to Scientific American, and the expansion of people's general understanding of science. Within these discussions, Carl Sagan lightheartedly enthused about the history of science and engaged the audience with captivating explanations of how the world works. Aside from strongly supporting the advancement of fostering the scientific education, his critics have outed Carl Sagan as a publicity seeker and careerist more concerned to maintain his reputation than to examine the facts about the universe empirically. This at the very least suggests a strong emphasis on E, in passionately getting the audience involved in his brilliant and skeptical rhetoric that would overshadow his methods of carefully integrating P to substantiate his explanations, often by referencing specific studies or examples in history. Thus making Bold, Weak E6 and Strong, Cautious P8 very likely suggestions for Sagan. From what I've listed above about Carl Sagan is already is consistent with I1, L2, E6, T7 and P8. Consequently, I think that Carl Sagan is a very good representative of the ILE type of information metabolism. Desiderius Erasmus was a Dutch humanist philosopher and theologian, the illegitimate son of a priest and was himself forced into a monastic life by his guardians. In the monastery at Steyr, his lifelong passion for Latin began and he quickly outstripped the ability of his tutors. He escaped the monastic life in his late twenties and proceeded to broaden his horizons by travelling and studying extensively. He eventually came to England and struck up a friendship with Thomas More, which lasted until the latter's death at the hands of Henry VIII (SLE). It was whilst making his way to England on a subsequent visit from Italy that he conceived his best known work, In Praise of Folly. Arriving at More's house in London, he quickly committed it to paper with More's support, in 1509. In Praise of Folly, Erasmus wrote this work with two intentions in mind; to satirize and inveigh against the offices and institutions of the Church, for which he had developed a deep hatred of during his time at Steyr. He attacks the monastic orders and their conception of worship as consisting in "the precise number of knots to the tying on their sandals". With more venom he goes on to say, "It will be pretty to hear their pleas before the great tribunal: one will brag how mortified his carnal appetite by feeding only upon fish: another will urge that he spent most of his time on earth in the divine exercise of singing psalms... but Christ will interrupt: 'Woe unto you, scribes and Pharisees, ...I left you but one precept, of loving one another, which I do not hear anyone plead that he had faithfully discharged.'" What is perhaps most prominent in Erasmus' work, is his unconventional approach to his studies and taking a peculiar interest in idiosyncratic works. Within these works, Erasmus satirizes the importance of doctrine and viewpoints in Christianity and instead makes a broad argument that the purpose of religion is to instil personal development and virtuous qualities. Interestingly enough, this and Erasmus' pursuit of multiple interests with the intention to foster his own personal development throughout the course of his life is in line with Delta values, more specifically with I+R in the Ego Block. This introduces the central theme of Erasmus' In Praise of Folly, namely his concern with religion as a worship 'from the heart' that has no need of the offices and intermediaries supplied by the Church. Erasmus insists that true religion is a form of Folly, in the sense that it is simplistic and direct, not convoluted with unnecessary sophistication and dogmatic doctrine. For Erasmus, religion is based on a thorough-going humanism, understood in its classical sense as a confidence in human reason to know and worship God. In a similar vein, Erasmus was no friend of scholasticism, nor indeed the philosophical fathers of his day, Plato (IEI) and Aristotle (LIE). Erasmus' hero was Augustine (IEI), from whom he took the doctrine that reason must be the servant of faith. Apart from In Praise of Folly, and later his Colloquia, much of his work consisted in Greek and Latin translations of the Bible. From this excerpt; "Due to limited financial resources, and with urging from his caretaker, Erasmus entered an Augustinian monastery a few years after his parent's death. This was most certainly not the life-style for him and may have precipitated his independent future. He disliked rigor and severity but it did provide the time for independent attention to his studies and the beginnings of his prodigious education." the sensitivity of Erasmus surrounding social rules brought him great stress out of fear that it may limit his freedom. This is a common fear for L4 types, when the creation of rules and structures actually limit personal development and understanding for this type. Furthermore, Erasmus' travels always kept him occupied and busy, with paying very little attention to trying to keep himself comfortable in living in one area, almost always absorbed in his work and giving little thought to his lived experience. As such, S5 is fitting for Erasmus - he hardly ever engaged in comforting activities and managing a clean household - despite the fact that he wished for such a lifestyle that benefited him and made him feel comfortable after have already completed his work. 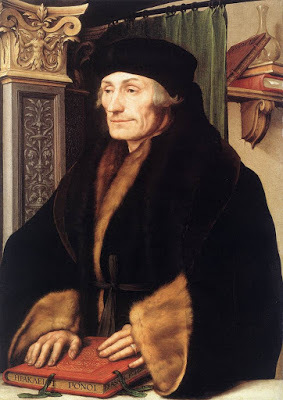 Erasmus strongly favored the lifestyle of achieving in a broad variety of areas, working independently in his research and not showing any sort of bias in religion or ideology. Nevertheless, Erasmus still had little issue with the intellectual dirty work; fact checking and examining primary source material - it still meant that his work had a stronger foundation compared to the poorly sourced works of other Christian scholars. Despite Erasmus' certitude in factual accuracy, it was perhaps more clear that this became more of a sore spot for him as his colleagues carried a stronger hold on the importance of factual accuracy in the advancement of humanism. Erasmus had used the information he gathered to simply support his ideals of humanism in religion. As such, there is a strong parallel between Erasmus' role in Christian humanism and the role of P6 types as information gatherers, gathering a large amount of information on a topic before quickly moving on to something new. Erasmus had an enormous influence on ushering in the Reformation, but surprisingly, in the struggle between Catholics and the Protestants - the latter of whom were undoubtedly closer to Erasmus' religious ideas - he eventually sided with the Catholics. This apparent contradiction of values best illustrates Erasmus' somewhat timid nature, he could not condone the violence of the Lutherans, preferring to attack the Catholics with his words instead of his actions. When More was executed by Henry the VIII for refusing to accept his supremacy over the Pope as head of the Church of England, Erasmus is quoted as saying, "Would More have never meddled with that dangerous business and left the theological cause". This quote brings into sharp relief between his idealistic and faithful nature and the uncompromising and corruptible nature of More. A more illuminating account of Erasmus' personality would be from this excerpt from his biography from an archive on European history: "He proudly could be called the 'mover and shaker' of Europe, a citizen of a world he created for himself. This roving international man of letters networked his way through life with his superior intellect and his penchant for 'a good fire, a good dinner, a pile of amusing correspondence and a handsome research grant.' His charm and humor and amazing ability to keep up a massive correspondence with hundreds of fans, scholars and friends continued unabated throughout his lifetime." This account gives a better perspective on an individual with Strong E, likely E8. Thus far what has been mentioned about Desiderius Erasmus points to Strong I and R, L4, S5, P6 and E8. In conclusion, I believe Erasmus is a timeless representative of the IEE type of information metabolism. To learn more about IEE, click here. Nikola Tesla was a physicist, inventor, mechanical and electrical engineer popularly known for his intellectual brilliance and achievements in the realm of electrical engineering. His inventions ushered in the beginning of commercial electricity and his revolutionary work in electromagnetism in the late 19th and early 20th centuries opened previously unconsidered possibilities to electricity's applications. 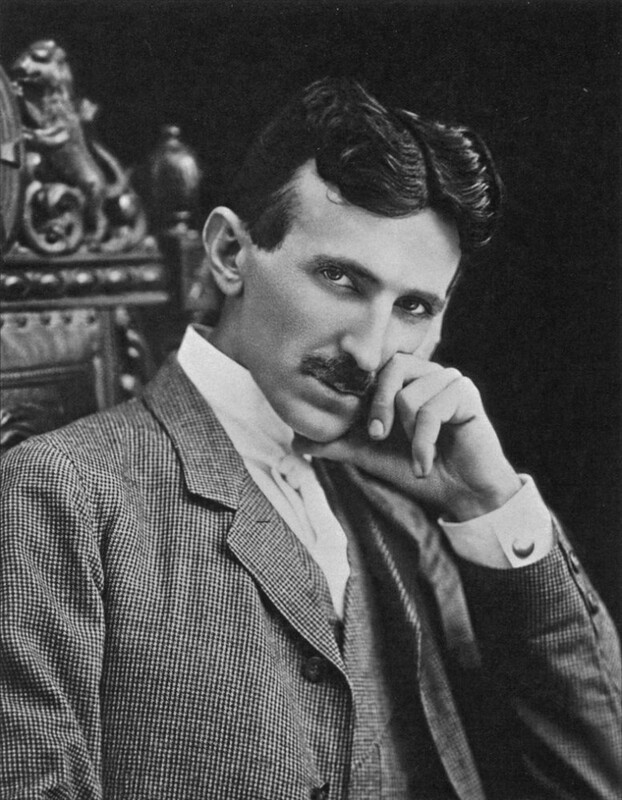 Tesla's patents and theoretical work formed the basis of modern alternating current (AC) electric power systems, including the poly-phase system of electrical distribution and the AC motor. Tesla demonstrated wireless energy transfer to power electronic devices as early as 1893, and aspired to intercontinental wireless transmission of industrial power in his unfinished Wardenclyffe Tower project (Tesla Tower) located in Long Island, New York. At the turn of the 20th century, Tesla's fame in the United States exceeded that of any previous inventor or scientist in American history, his name becoming synonymous with the archetypal "mad scientist". Nikola Tesla excelled at math and science, even as young boy he was able to compute advanced calculus problems in his head, without having to write anything down. His natural talent for interpreting the world around him through mathematical and logical constructs dominated the way he processed information throughout his life. As a young man, Tesla was constantly thinking of ways to improve upon the inventions of others, often taking his "vision" of what it would look like in his head and carefully working to get every measurement exactly right. He carefully ordered his thoughts and ideas to better understand his interpretation of scientific phenomenon. Rules, statements and algorithms dictated the work of Tesla and his orientation towards logical structure was most fluent in his blueprints. This very abstract approach to dealing with planning inventions made those who worked with him reminiscent of a "da Vinci". Much like the real Leonardo da Vinci (ILE), Tesla was also heavily drawn to highly theoretical topics that sought to make sense of the world; a polymath of scientific pursuit. That said, Tesla was still able to maintain a balance of physical and mental organization. This expertise defends the argument that Tesla processed the world through abstract principles, meaning that he has Strong L+I in the Ego Block, and that as evident of his own thought process, Cautious I2 is used in service of Bold L1. Tesla first started working as an engineer at the Continental Edison Company in Paris, where he was tasked with designing dynamos. While living in Europe, he came up with the design of his AC induction motor and built a functional prototype. When Edison discovered this, he invited him to move to America so that he could directly collaborate with him. In 1881, Tesla agreed and met Edison in New York. The two got along initially, but this brief cordiality grew into a bitter rivalry as Edison and Tesla both fought over whether DC or AC worked, respectively. Thomas Edison had built his entire company on products that used DC and he didn't want to see his company go bankrupt due to an innovation that would make his inventions obsolete. Through time, however, AC became the only system used for distributing electrical power to residential, commercial and industrial zones. Yet, in spite of AC victory later on, Tesla was still met with great obstacles that lied in the path of his dream of providing free energy to the world. In 1900, backed by $150,000 from financier J.P. Morgan, Tesla began testing of his so called "Wireless Broadcasting System" tower on Long Island, New York. This broadcasting tower was intended to link the world's telephone and telegraph services, as well as transmit pictures, stock reports, and weather information worldwide. Unfortunately, Morgan cut funding when he realized that it meant free energy for the world. Tesla was easily used by tougher men like Edison and Morgan, he was naive towards the idea that others might take advantage of him. This suggests a lack of awareness or "blindness" matter of F, Tesla's gentle and collected nature compared to the ruthless ambition of J. P. Morgan (SLE) provide good support by contrast to Tesla's Weak and Cautious F4. In his personal life, Tesla was emotionally detached and was deeply absorbed in his thoughts, paying very little attention to the social impact he had on others. His entrenchment in abstractions and logical thought terminated his attraction with other individuals and he showed a persistent need for social isolation. The absent-minded nature of Tesla often left him a keen interest of light-hearted social circles, Tesla would often appreciate the gesture of raising the spirits of others and keeping people in a positive mindset, though he would much rather stick to his fixated work-ethic. Despite this, Tesla was still somewhat enthusiastic in others interested in his highly articulate and insightful theories, yet he almost always failed to impress and command the attention of others. Tesla attempted to promote himself, although Tesla lacked social skills and in the later parts of his life, was widely considered to be mad. This provides good evidence for E5, being quite aware of the need to present oneself as charming and polite, but he almost always across as stoic and unreachable. In addition to having difficulty to engage others with his inventions and new engineering ideas, Tesla became obsessed with the number three, he often felt compelled to walk around a block three times before entering a building, demanded a stack of three folded cloth napkins beside his plate at every meal, etc. His symptoms were considered by some to be evidence of partial insanity and this undoubtedly hurt what was left of his reputation. Tesla became very easily overpowered by his physical surroundings and sought to cultivate a relaxing environment where he could escape from the aggression and social pressure of reality. He also carried a great meticulousness in his appearance and dressed modestly to help moderate his physical tastes. Tesla's hypersensitivity to sensory stimuli manifested from fearing to wear specific kinds of jewelry to refusing to touch people's hands. He even once stated; "I know I am completely worn out, and yet I cannot stop my work. These experiments of mine are so important, so beautiful, so fascinating, that I can hardly tear myself away from them to eat, and when I try to sleep I think about them constantly. I expect I shall go on until I break down altogether." The following suggests bold and valued S6, in that Tesla wanted to cultivate a relaxing environment for his work, yet would periodically forget to take care of himself, thus justifying the "mad scientist" archetype even further. Nikola Tesla was a futurist by nature and In addition to his work on electromagnetism and electromechanical engineering, Tesla contributed in varying degrees to the establishment of robotics, remote control, radar, and computer science, and to the expansion of ballistics, nuclear physics, and theoretical physics. Tesla drew parallels between existing knowledge and concepts by examining the various hypothesis of the variety of phenomena he examined. Over the course of his life, Tesla registered some 300 patents under his name, and traces of his inventions can be found in many modern-day devices, including in some unexpected places, such as remote-controlled boat toys and letter-shaped neon lights. But not all of Tesla's futuristic visions came to fruition. Some of the inventor's most far-out and ambitious dreams went unrealized, such as his vision for the wireless transmission of energy. In other cases, what Tesla invented was simply not practical enough to replace existing systems, such as the blade-less steam turbine, or was too dangerous to use, such as a steam-powered electric generator that came to be known as the "earthquake machine,". Still, Tesla's open-mindedness and curiosity in a wide range of subjects is evenly balanced with the esoteric philosophies he developed later in life, all of which is still consistent with Strong and Cautious T8. Thus far what has been mentioned about Tesla points towards L1, I2, F4, E5 and S6 and T8. In conclusion, I believe Tesla is a very good example of an LII. To learn more about LII, click here. Click the Logo to view our Facebook Page and check out our services.